In my opinion, Rwake were on the right track with their previous release, ‘If You Walk Before You Crawl, You Crawl Before You Die’, but they seemed to have strayed slightly from that design. It’s hard to say whether or not this will be a positive or negative effect. The music on ‘Voices of Omens’ is still top-notch, and they’ve definitely not lost their intensity… it just seems a lot more straight-forward than their last album. 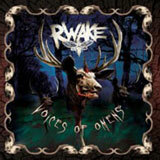 That said, even “straight-forward” for Rwake is far more innovative than most. Gone are the vocal samples, and most of the blistering guitar solos that were in abundance on ‘IYWBYC…’ (but not completely, though; there’s still the odd one here and there, and some awesome guitar riffs). The acoustic sections are apparent but to much less of an extent. This seems to concentrate far more on the heavier elements of the band, introducing the dual-vocals to slightly better effect, and much more reminiscent of their earlier stuff. This isn’t Rwake devolving their music, before you start to worry. They still have an original sound of their own, and the music doesn’t suffer terribly from the concentration on pure sludge rather than atmosphere. ‘Voices of Omens’ still has many a moment that make you value listening to such a great band, and with the softer sections fewer in between, it works well -the female vocals in ‘Inverted Overtures’, and the almost folk-esque acoustic intro track, being but two of those moments. It’s not the rollercoaster ride their last LP was, but then again, that was a hard act to follow. I think Rwake realised that and took the departure so as not to create an inferior clone. They chose wisely, and this is an album that should take pride of place in any doom/sludge metal fan’s collection. If I was to sum this up in as fewer words as possible, I’d say, “It takes the best elements of ‘If You Walk Before You Crawl…’, and dishes them out sparingly amongst their intense brand of sludge/doom metal”. The release of this has been long-awaited, and you will not be let down.